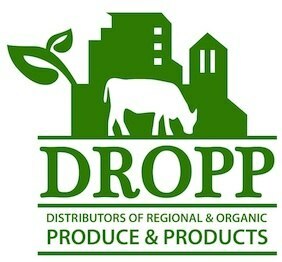 The recently established DROPP, Distributors of Regional & Organic Produce and Products, is a side project for the Great Basin Community Food Cooperative in Reno, Nevada. The food cooperative came into existence in 2005 under a buyer’s club model. Although the food coop is still going strong, DROPP is an effort to improve the infrastructure between the informed consumer and the sustainable grower and is best described as a food hub where farmer and fork collide. “As we were building new relationships with local farmers we started sending out local availability lists to restaurants and members of our coop just saying ‘this farm has this and this farm has that.’ It was kinda tricky because we would send those out once a week and then the restaurant would say: ‘I want some of that’ and they would ask: ‘how much is it? When can I get it?’ So then we called the farmer back and said: ‘how much is it? When can we get it? ‘ and then we’d call the restaurant back and tell them and they would say ‘yes’ or ‘no’ and it was just a lot of back and forth. We did that for a while then we got a grant through the USDA to create a website to do all this for us. The website was created two years ago in December…,” explains Nicole Sallaberry. Nicole Sallaberry is the sole part-time paid employee of DROPP. Her salary is subsidized by the food coop during the slow season and met through membership dues during the busy season. DROPP’s business model was inspired by the work of La Montanita Coop in New Mexico. They borrowed La Montanita’s idea of defining their ‘local’ foodshed by the geographical watershed. For DROPP, ‘local’ is the watershed of the three closest drainage systems: the Truckee River, the Carson River, and the Walker River. The largest population cluster is within a 40 mile radius of the store but the foodshed goes as far as 200 miles out from the center. Comprised of a virtual shopping system, distribution and storage center with local delivery/pick up service, DROPP considers itself an agent for local farmers by providing them with the connection to their local customers. Full access to the website for both producers and consumers is met through a nominal membership fee. “The DROPP venue gives them [the farmers] more customers than just our store produce department. It just gives them a larger audience. Plus the whole idea is that it saves them time so that they can drop off to just one place instead of going to each restaurant and running around to where everything needs to go. It’s just one stop so they can go back to what they need to do,” says Sallaberry. In short, a farmer within the foodshed will, adhering to the guidelines of DROPP, post details of available produce twice a week including prices, quantities and if a manufactured product, detailed ingredient lists. As part of being a site member, the farmer is obligated to get the produce to the storage and distribution center on time. Farmers that utilize the DROPP distribution model must adhere to established and enforced guidelines. “We always buy locally first if there is something available that meets our guidelines. We give preference to locally farmed things. If they are certified organic its really easy because we know their growing practices are in line with the mission of our store, but if not we do an inspection of their place and producer’s certificate. We go and make sure they don’t use any synthetic fertilizer, any pesticides or herbicides; anything toxic and that they have no GMO products. We kind of go out of the way to invite the smaller people and the people that are being good stewards of the watershed to sell at our store and through the DROPP,” states Sallaberry. DROPP consumers go onto the website, look up their favorite farmer and put in a weekly order. The farmers receive an email after the ordering cycle telling them what has been ordered. They are then expected to deliver the items the following day at a certain time to the cooperative’s storage facility (basement of the Greater Basin Food Cooperative store). The items can then be picked up at the distribution center (inside the Great Basin Community Food Cooperative building) or delivered for a nominal fee of ten dollars. DROPP works largely with the wholesale side of organic consumption. Typical customers include restaurants, caterers and local stores. Occasionally, customers of the Great Basin Community Food Cooperative will utilize DROPP for parties, reunions or meetings. Individual orders are not an issue but consistent bulk orders afford a higher degree of potential profit for DROPP. Being in Reno, one would presume local casinos may be possible future customers of the cooperative but as Sallaberry explains, there are a number of issues with tapping into the world of gambling tourism. For one thing, liability insurance is not high enough among smaller farmers to work with large business such as casinos. Quantity and pricing are also issues: “most of the food in our country is subsidized and so its pretty cheap and when you look at the real cost of food that these small local farmers are producing they are probably a bit more expensive than that,” explains Sallaberry. Funding for DROPP is in large part based on the cooperation of its parent organization, Great Basin Community Food Cooperative. The experiment has received grant money in the past, but unfortunately it only went so far. In fact, the grant money was used to set up the website shopping system, but the job was not a good one and there are many glitches. Currently, Sallaberry tries to assist the farmers in coordinating shared transport to reduce the amount of time fresh produce is ‘hot’ or in a non refrigerated condition after harvest. DROPP hopes in the future to have a cold storage truck they can use to pick up the produce from the farmers to save them from having to leave the farm and take time away from the busy business of growing. Still in the start-up phase, the long term feasibility of DROPP remains in question. A combination of profit and more efficient technology will be essential to DROPP’s sustainability. “By September of 2014 if it is not at least breaking even, or even making a bit of a profit hopefully, we are going to end the program but I feel really optimistic about it,” shares Sallaberry. Nevada’s high desert topography, short growing seasons and temperamental weather patterns are all challenges to the success of farming and food hubs in the region, but farmers are adapting. “I think our biggest challenge is education. I think once people learn about why things costs what they do, and taste them and meet their farmer then they are a lot more likely to jump on the bandwagon,” states Sallaberry. As Sallaberry explains, the greatest benefit of DROPP is its ability to put people in touch with their food sources and food sources in touch with their consumers. “The more that people can eat locally and be good stewards of their land and water the better off the whole country and the whole world is because you are not taking things from other food sheds or water sheds in other regions of the world or country. I think just building that up makes being interdependent more possible,” concludes Sallaberry. Sustainable food hubs are becoming a foundational step to altering the structure of the American food system by creating local relationships with food and farmers. By piggybacking onto established cooperatives many start-ups with a model like DROPP stand a better chance of surviving unpredictable economies and a lack of consumer education.